Deputy Secretary-General Jan Eliasson (left) addresses students and faculty of the University of Geneva. 18 november 2016. “As the line between ‘national’ and ‘international’ has become blurred, almost every issue debated and dealt with at the domestic level – migration, urbanisation, health, energy – has an international dimension,” Deputy Secretary-General Jan Eliasson said in his lecture at the University of Geneva, Switzerland. “The good international solutions are indeed in all States’ national interest – even if we sometimes have a hard time making that case,” he added. Since being appointed on 1 July 2012, Mr. Eliasson has travelled around the world on behalf of Secretary-General Ban Ki-moon. “Today is my last day outside New York in my ‘DSG’ capacity,” he said, noting that he wished to use this opportunity to look back and look forward at the role of the UN and by that international cooperation. “Let us be clear: the world today is not a pretty place,” he said, citing the rising numbers of refugees, displaced persons and people in dire humanitarian need owing to armed conflict, disasters and governance failures, as well as the effects of polarisation and divisiveness – from national political campaigns to the work of the UN Security Council. Conflicts have grown more protracted and complex – and that abominable crimes are being committed with impunity, sometimes hardly noticed. Gaping and growing inequalities have undermined peoples’ belief in globalization and market economies.“Let us always remember – the United Nations is a reflection of the world as it is. But it is also a reflection of the world as it should be. Our job is to close that gap – or at least reduce it,” he said. Turning to the three interdependent, mutually reinforcing pillars of UN work – peace and security, development and human rights, he said there is a case to be made that the United Nations has helped to prevent a third world war, as formulated in the preamble of its Charter. It has also contributed to the historic decolonization some decades ago. The UN has also helped resolve many inter-state and civil wars over the years through peacekeeping, mediation and peace-building. Over the past decade, we successfully ended peacekeeping operations in Sierra Leone and East Timor, and will soon do so in Liberia and Cote d’Ivoire, he said. Yet, there is much to do to address today’s peace and security challenges. A number of conflicts such as those in Syria, Yemen or Ukraine, have growingly become influenced by larger geopolitical tensions. The Security Council often finds deadlock and division instead of a clear and unified voice. “Tragically, the [Syrian] conflict has more and more turned into a proxy war. The country’s fate has gradually moved to be decided by outside actors,” he said. Increasingly a sectarian or ethnic dimension in today’s conflicts has made traditional diplomatic tools less effective. The dangerous rise of violent extremist groups with territorial ambitions and cross-border reach, also through propaganda and hate speech, are made possible by Internet and new social media. “Above all, I believe we must develop a culture of prevention. We must move from crisis management to conflict prevention, from early warning to early action, and from rhetorical support for prevention to concrete action,” he said, noting that preventive diplomacy is a priority of Secretary-General-designate Antonio Guterres. Mr. Eliasson said that last year, important gains were made and new horizons opened up for progress towards sustainable development, with the adoption of the 2030 Agenda for Sustainable Development and Paris Agreement on climate change, which show that countries can overcome their differences and can take action for the common good. At a time of record heat in the world, Member States embraced the Paris Agreement in record time. Almost 100 countries, accounting for 70 per cent of greenhouse gas emissions, have now joined, he said. Together, the 2030 Agenda and the Paris Agreement represent historic commitments to collective, responsible action, which must be taken by all nations in the interest of children and grandchildren and of life on this planet. “We may have a Plan B in life – but we surely do not have a Planet B,” he said. On human rights and the rule of law, he said that the UN has worked hard to move the world into an “age of accountability,” not least through support for the International Criminal Court (ICC) and other international tribunals, which have brought some Heads of State and other political leaders to account. Yet, not all countries accept the ICC’s jurisdiction. And sadly, a number of countries have taken steps in recent weeks to withdraw from the Court. “We are calling on countries to work with the ICC rather than against it,” he said. The Secretary-General’s Human Rights Up Front Initiative reflects the UN’s conviction that violations of human rights are the most effective early warning signs of situations that could escalate into instability, atrocities and war. “This preventive approach must guide our responses to the threat of terrorism and violent extremism,” he said. The UN is launching Together – a worldwide campaign against xenophobia – one of the outcomes of the UN Summit for Refugees and Migrants. The campaign highlights the strength of diversity in nation states, to promote mutual understanding, and to help societies address the challenges of integration. There are reasons for optimism, not only the SDGs and the climate agreement, but also the growing role of women, the dynamism of the world’s young people and major advances in science and technology. “Diplomacy remains as important as ever,” he said citing the agreement between Iran and the P5+1 [permanent members of the UN Security Council and Germany] countries as a reminder that even the most intractable issues can be resolved with patience and diplomatic skills. Former Secretary-General Dag Hammarskjöld always underlined the importance of having a clear vision about the future, also noting that equally important for the future are the many steps taken tomorrow and the day after tomorrow. Also in Geneva, Mr. Eliasson held a press conference, his last outside New York as the Deputy Secretary-General. For the near-verbatim transcript, click here. 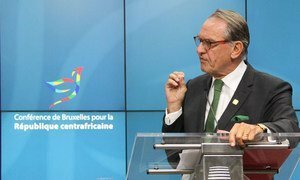 In Brussels, United Nations Deputy Secretary-General Jan Eliasson today urged an international conference for the Central African Republic (CAR) to show solidarity and pledge the necessary financial support to the Government-identified priorities and reforms needed for the African country’s rehabilitation and stabilization.